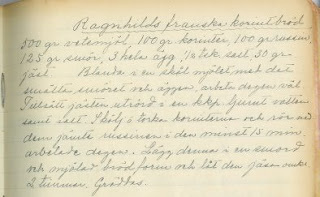 I have no idea who Ragnhild was - but whoever she was she knew how to make a loaf. We toasted this bread and had it with our tea - it is very good. Mix the flour with the melted butter and the eggs and stir it thoroughly. Dissolve the yeast in 150 ml water and add it and the salt to the dough. Add raisins and currants and work the dough at least 15 minutes. Put it in a greased and "breaded" loaf pan. Let rise for about 2 hours. Bake. I'm not very good at following recipes but I tried hard today. The only thing I substituted was the currants (can I still call it current bread?) as I didn't have any and it is impossible to get them in my small town. The dough is very soft and sticky - it needs to be kneeded 15 minutes (by hand) or even more. I think I left the machine running for close to 10 minutes. I wasn't quite sure what kind and size of pan to use but ended up using a 2 liter loaf pan, next time I think I'll use two 1½ liter pans. We seldom flour our pans but if you don't have breadcrumbs do as you're used. I baked it for 40 minutes in 200° C.